In your journey to Makalu Base Camp Trek with Himalayan Joy Adventure, you walk into the wilderness of the Makalu Barun National Park. Makalu being the fifth highest mountain in the world dominates the region around it. You will reach the base camp, spend your time there, witness breathtaking views of Himalayas, and return with a lot of memories. When you trek to Makalu base camp, you will walk alongside Arun River for days and reach to a more remote and pristine region of Makalu Barun National Park. As you walk into the wilderness for days, you finally reach the base camp. The breathtaking views of Makalu, Chamlang, Lhotse, Kanchenjunga, Everest, and so many other mountains accompany you the major parts of your journey. Makalu Base Camp Trek is not as popular as other classic trails of Nepal like Everest Base Camp Trek, Annapurna Base Camp Trek, or Annapurna Circuit Trek. With few villages and teahouses on the way, you have to be well-prepared for this trek. So, you should have enough food supplies with you, other essentials, and tents. You will be camping several nights on the wilderness. One of our Himalayan Joy Adventure’s representative will pick you up from Tribhuvan International Airport and transfer to your hotel room. After checking into your hotel, you can get refreshed and then visit our office. Or, you can spend your time in Thamel - a tourist hub of Kathmandu. In Thamel, you can shop for your trekking gears or spend your time discovering the unique culture, tradition, art, and architecture of Nepal. At the evening, we will host you dinner in a typical Nepali Restaurant and drop you off at your hotel. Today, you will travel to different historical places of Kathmandu Valley. Here are several UNESCO-listed world heritages. Our city guide will take you to Pashupatinath, Boudhanath, Swayambhunath, and Kathmandu Durbar Square. If you allocate one more day for sightseeing in Kathmandu, you can visit other heritage sites like Bhaktapur Durbar Square, Patan Durbar Square, Kirtipur, and more. After sightseeing, our guide will transfer you to your hotel room. You can have a cozy sleep after a long and tiring sightseeing day. A 35-minute scenic flight takes you to Tumlingtar - a beautiful town located between the Arun and Sabha River in Sankhuwasabha district. After landing at Tumlingtar, you begin your trek to Khandbari. Lying at top of a hill, Khandbari is the district headquarter of Sankhuwasabha. Rai ethnic group are concentrated here. It takes you about 3-4 hours to reach Khandbari. Overnight stay at a lodge in Khandbari. Today, you travel by bus for three hours along a bumpy road to Num. You will have your lunch and then begin your trek towards Sheduwa. In the early part of the hike, you descend through a forest and fields of paddy to the Arun River. The latter part of the descent is quite steep, but this part of the trail is quite amazing. You then cross the river through a suspension bridge. From there, a three-hour ascend to Sheduwa is quite difficult. Sheduwa is a beautiful village where you have to register your entry to Makalu Barun National Park. 05 Days TREK TO TASHIGAON,5HRS. Not as challenging as yesterday’s hike, you hike for about 4-5 hours today to reach Tashiagon. You pass through Dhargaon en route to Tashiagaon. The trail passes through a forest and almond farms. Tashigaon stands at the altitude of 2,100 meters above the sea-level with an impressive structure. Built on several steps on a slope of a hill, Tashigaon is quite a beautiful village. Trekkers can take a hot shower in Tashi gaon and get freshened up. 06 Days TREK TO KHONGMA, 5HRS. A tough day awaits at Tashigaon. Today, you begin your trek from Tashigaon and March towards Khongma Dada. You gain a total of about 1400 meters of elevation. In the first few hours, you walk through a forest of rhododendron and oak onto a small pass at 3100 meters. You then reach a pasture where shepherds have built temporary huts. From there, you walk through steeper trail passing through grazing lands. You then arrive at a small lake. You then walk for a little while to reach Khongma Dada. We will pinch our tent in Khongma. Overnight stay at a tented camp in Khongma Dada. As you are already above 3500 meters, you spend the day acclimating with the high altitude. You can spend your day exploring the area and visiting Thulo Pokhari. There are so many viewpoints around Khongma. You can view the majestic views of the Himalayas from those viewpoints. So, spend your day going for short hikes around Khongma. The day is full of breathtaking views. You begin your trek after your morning breakfast towards Dobate. Gazing at the majestic Himalayas and surrounding landscapes, you pass through the magnificent lake - Thulo Pokhari (Big Pond). Near the lake lies a small pond that people call Sano Pokhari (Small Pond). From there, you continue your walk as you have four passes to cross. First, you pass through Kauma La Pass (3,603 m, then trek to Keke La Pass (4127 m). After crossing Keke La Pass, you will head towards Shipton La Pass (4170 m). You will reach a beautiful lake near Shipton La Pass that people call Kalo Pokhari (Black Pond). Then, after walking for about two hours, the trek takes you through Tutu La Pass (4080 m). Magnificent views of Chamlang Himal, Peak 6, and Peak 7 awaits you at Tutu La Pass. After witnessing some magnificent scenes, you continue your walk for a while to reach Dobate. Overnight stay at a teahouse in Dobate. 09 Days TREK TO YANGLE KHARKA,5HRS. You trek through dense forests of rhododendron, pine, and oak and cross Barun River on the way. The trail through this dense forest to the river is quite steep. You then cross Barun River to reach the upper part of the valley. For a couple of hours of walk from there possess some objective dangers as well. So, be extra careful to avoid getting hit from any fallen rock. After walking for a couple of hours through that challenging terrain, the trail opens up to a pleasant trail. You can comfortably walk on the trail and slowly gain the altitude to finally reach Yangle Kharka. Yangle Kharka is only a seasonal settlement. You will cross the Barun River by a bridge and then walk through boulders. A large Buddhist prayer wall comes to your sight and you continue your walk to the valley in front of you. You pass through yaks’ grasslands and green lush forest for about 2-3 hours. The forest en route to Langmale Kharka comprises of rhododendron and juniper. Continuing your walk takes you to Sherson from where you can see a part of Lower Barun Glacier. The magnificent view of Mount Makalu from there captivates every single trekker. People also call this place as the lower Base Camp. From there, you continue your walk and pass through Merek to finally reach Langmale Kharka. Overnight stay in Langmale Kharka. 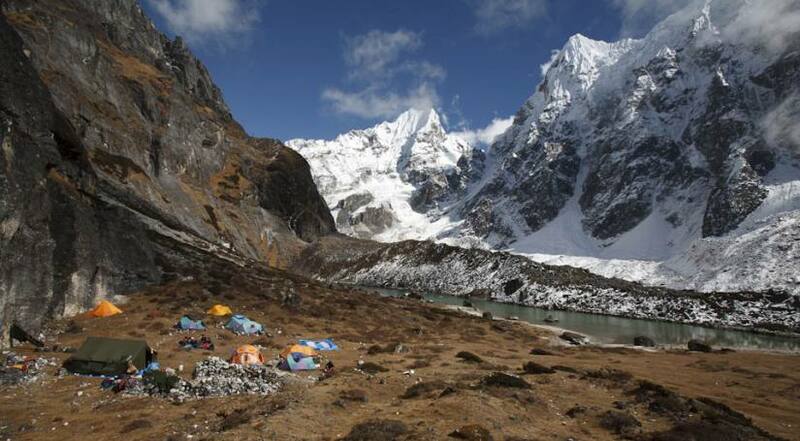 Today, you will reach the main destination - Makalu Base Camp. From Langmale Kharka, you will gradually ascend to Shersong and further up to Makalu Base Camp. The trail is flat and icy surrounded by snow-covered mountains. You walk for 6-7 hours to finally reach Makalu Base Camp. The final part of the trek takes you through the moraine of Barun Glacier. The glorious view of surrounding mountains including Makalu delights trekkers. Makalu Base Camp lies right beside the huge Barun Glacier. The view of south-face of Makalu from the base camp is quite charming. The lakes and glacier surrounding Makalu and other mountains are worth exploring. In the early morning, you will ascend to a viewpoint from where you can capture some breathtaking scenes. You can see as far as the Everest, Lhotse, Nuptse, Barunche, and more. After visiting the viewpoint, return back to the base camp. Today, you will use the same trail that you had used a couple of days before to come back at Langmale Kharka. Witness the views that you had missed on your way to up. You will trek to Dobate through the same trail that you had used a few days ago and arrive at Dobate. Cross those four passes and visit those beautiful lakes and end your walk at Dobate. From Dobate, you then retrace your path back to Khongma and then continue your walk to arrive at a forested ridge. From there, you descend through rhododendron, juniper, and oak forest to arrive at Tashigaon. Overnight stay at a teahouse in Tashigaon. The first part of the trail takes you down to Arun River. After crossing the river, you will ascend all the way up to Num. Overnight stay at a teahouse in Num. From Num, you will travel to Tumlingtar by jeep through the bumpy road. It takes about 4-5 hours to arrive at Tumlingtar. Overnight stay in a lodge in Tumlingtar. Early in the morning, you will travel back to Kathmandu through a scenic 35-minutes flight, After landing at Tribhuvan International Airport, we will transfer you to your hotel room. Then, you can spend the rest of the day resting in your hotel room or exploring Kathmandu. You can spend your day in Thamel as well. Every day the world is facing a big issue of environmental pollution and in Nepal as well. Our field staffs are quite conscious about environmental pollution at any time and we encourage all. We would suggest to our guest to use boiled water or water purification pills than buying a bottle of water, it helps to avoid plastic bottles which can take a long time to disappear. During the trek, if possible you can order same items food in a group which minimizes the fuel used and to make a campfire is almost forbidden. We would encourage being a responsible traveler so, just leaving foot-print on the trail and bring out all non-biodegradables which you had. The starting point of this trek is Tumlingtar which accessible by domestic airplane and Local transportation bus/ jeep. But if you go by bus/jeep, need more days because it is long way driving to Tumlingtar.